Here is the link to the AMETSOC official statement, cited in the letter. AMETSOC is hardly the only such professional scientific organization to do so. The statement of the American Geophysical Union. Not surprisingly, the AGU issued their own response to Administrator Pruitt’s comments. The statement of the Ecological Society of America jointly with 30 other scientific organizations. 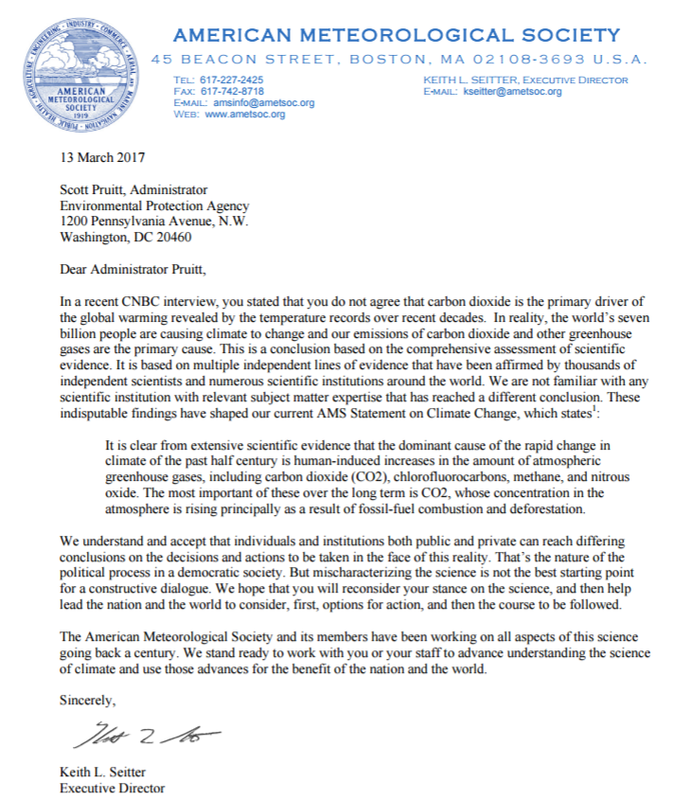 The statement of the American Association for the Advancement of Science, which is the same letter the ESA signed. I am also a proud member of the American Statistical Association, in fact, and of ESA and AAAS as well. This entry was posted in American Association for the Advancement of Science, American Meteorological Association, AMETSOC, Anthropocene, atmosphere, being carbon dioxide, Bill Nye, Carbon Worshipers, climate, climate change, climate disruption, climate education, Climate Lab Book, David Archer, Donald Trump, ecology, environment, environmental law, geophysics, global warming, greenhouse gases, Hyper Anthropocene, meteorological models, meteorology, National Center for Atmospheric Research, NCAR, Our Children's Trust, Principles of Planetary Climate, Ray Pierrehumbert, science, the right to know, the tragedy of our present civilization, The Weather Channel, The Weather Company. Bookmark the permalink.